Adam Eddington, a bright high school student with an interest in marine biology, plans to spend his summer working for Dr. O’Keefe on the island of Gaea. In the airport before he boards his plane, he meets Kali, a beautiful girl, who warns him that Dr. O’Keefe and his colleague, Canon Tallis, are dangerous and cannot be trusted. After this meeting, things change dramatically for Adam. Suddenly, his credentials and motives are questioned, and he can’t decide whether to place his loyalties with Dr. O’Keefe and his loving, innocent daughter Polyhymnia, or with Kali and her dad, Typhon Cutter, who asks Adam to spy on his behalf. Of all the L’Engle books I’ve read so far, this one is the strangest. From the start, the book gives the reader an unsettled feeling which really doesn’t resolve itself until almost the end of the story. This feeling arises from the suspenseful plot as well as from the strange otherworldliness of 12-year-old Poly. Dr. O’Keefe describes his daughter in terms of her ability to love, saying, “She loves in an extraordinary way for a twelve-year-old, a simple, pure outpouring, with no looking for anything in return.” This ability makes her character seem somehow sheltered and gullible, and annoys me a little bit because she doesn’t seem to have any flaws. 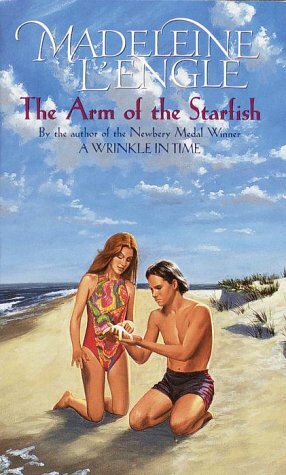 At every moment of the story, Poly is this shining example of perfect human love, and that perfection doesn’t jibe with real-life adolescence, or with L’Engle’s depiction of adolescence in her other books. Vicky Austin might go overboard with her self-deprecation and sense of otherness, but she is ten times more believable than Poly. I had some trouble, also, buying into the starfish regeneration research that Dr. O’Keefe works on. The entire concept - and the potential for it to be abused by evil forces - reads more like the subject of a superhero comic than a science fiction novel. The science behind regeneration in humans seems too easy, and I never quite felt the sense of urgency the characters feel about protecting those secret scientific discoveries. I’m also starting to grow somewhat weary of these “special” kids L’Engle writes about, who are so well-versed in poetry, music, and culture. Is the Tallis canon really something tweens or teens would recognize? I found myself questioning that and wondering if she could have told the story without quite so many precocious characters. Saying all of this makes it sound like I didn’t enjoy this novel, and that actually is not the case. I was drawn into the mystery almost immediately, and enjoyed getting to know Adam’s voice. I was pleased to see the subtle references to A Wrinkle In Time - especially Poly’s siblings’ names - that made it clear that Dr. O’Keefe is Calvin, and his wife is Meg, even though the narrative never says as much. It was an interesting read, and it left me with a lot to think about and process before moving onto the next book, The Young Unicorns.